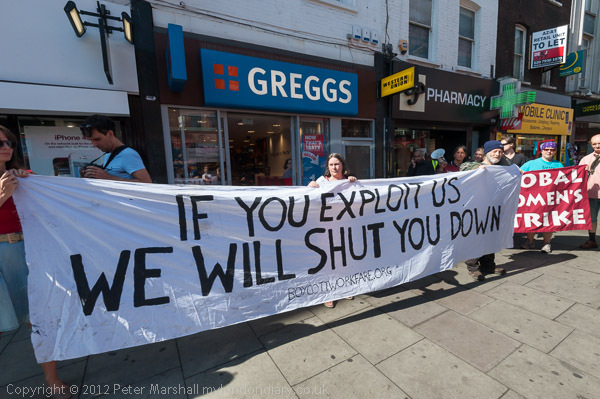 Saturday 8 September was billed as a Day of Action Against Workfare, the UK government’s scheme to get the unemployed working for nothing in order to keep their benefits. There would be some virtue in a proper work experience scheme, but this isn’t set up to be one, and lacks any real safeguards for those taking part against unscrupulous employers who use it simply as a source of more or less free labour to increase their profits. Although the scheme was introduced as a voluntary one, many of those taking part have had it made clear to them they will lose benefits if they do not take part, or if their attendance or performance is unsatisfactory. Many complain it essentially forces them to work full-time in order to get their benefits, the equivalent of being paid around a quarter of the minimum wage. Many shops are simply using workfare to replace existing proper jobs, saving them the cost of wages. One of the people on the protest reported she had found around a dozen unpaid workers in a single large charity shop, a mixture of those convicted of crimes and on community service orders and the unemployed on workfare. The unemployed can be effectively forced into doing more than double the number of hours on a workfare scheme than the maximum sentence of community work a court can impose. In taking the pictures I wanted to show the protesters clearly, and the placards and banners were important as always to include the protesters views in the images. But it was also important to show the names or logos of the various shops involved, including several well-known charities in as many of the pictures as possible. I knew of three protests in different areas of London, but because of the times and distances involved decided I could only cover two of them. The evening before, as usual when covering various protests, I’d worked out routes and rough timings for getting from place to place using the Transport for London (TfL) web site. It’s a very useful site, but not always perfect, and often fails to spot some of the alternatives and occasionally goes completely haywire. But it’s useful in particular because it knows which underground lines will be closed for maintenance work and some of the likely disruptions to buses. Today my journey from a tour with a group in Camden High St to Brixton was a fast and straightforward one, getting the Charing Cross branch of the Northern line from Mornington Crescent and then changing to the Victoria at Oxford Circus, almost as TfL had suggested, and I did it few minutes faster than their estimate, arriving in time for a short walk around Brixton before the protest outside Poundland got going. This was tricky to photograph because it was taking place under some scaffolding along the front of the shop, on a narrow pavement to a busy road. Not an ideal situation. 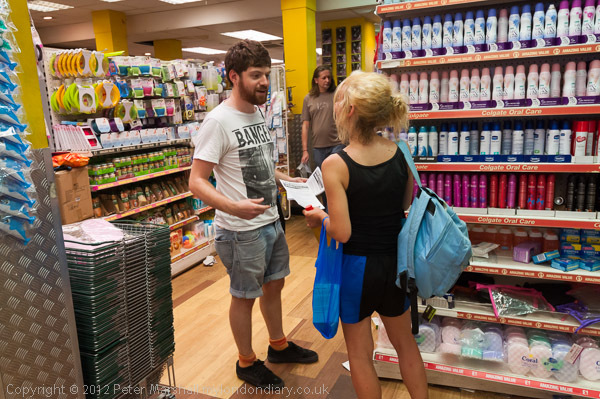 When a couple of the protesters went inside the shop to hand out leaflets at first I hesitated, photographing through an open door from the pavement. There are virtually no restrictions in photographing on the street, but things are a little different on private property. But soon I went inside and took a few pictures inside the store, working a little more discretely – and without using flash, easy enough thanks to digital – the image above was with the D700 at ISO 3200. You don’t actually need permission to photograph on private property in the UK, but had I been asked to stop by staff I would have been obliged to do so. Fortunately nobody seemed to notice; perhaps the security there are on workfare, certainly many of the staff seemed to be sympathetic to the protest and I was told there were quite a few on workfare. I also decided to show the shoppers from behind so they were not readily identifiable, although I did talk to one or two of those I photographed and I think they were happy to be in the pictures. If you are taking part in a protest in public there is an implied (though not always actual) willingness to be photographed, but if you are inside a shop, you could argue that you had an expectation of privacy. My next journey took me to Victoria, where I was hoping to photograph a quite different event, but found I was far too early for them to be leaving the Catholic cathedral, and decided not to wait around for the hour or more before anything much would be happening. 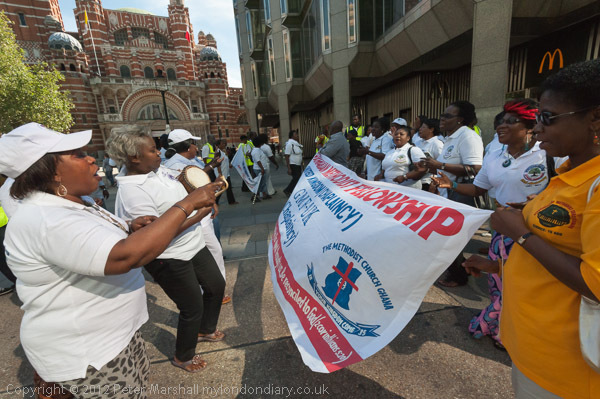 But then I found another group to photograph gathering outside the cathedral I’d known nothing about, Ghanaian Methodists celebrating ten years of their UK chaplaincy with some vigorous dancing. They were very different from the Methodists I know and I had to photograph them. TfL had come up with some interesting suggestions for the next stage of my journey, to Sipson, around ten miles out from central London, close to Heathrow airport. Some seemed more trustworthy than others (and TfL sometimes suggest some strange things) and I decided to take the Piccadilly line to Hounslow West and then catching a bus. It was a long journey, but one of the essential things in my camera bag is always a good book. It’s a large site, but the parts of it they have worked on are interesting and impressive, and it was well worth the visit, even if the photographs aren’t my greatest. On a warm summer afternoon it seemed a very attractive place to live, although I’m not sure I would like such rather basic facilities in the cold of winter. 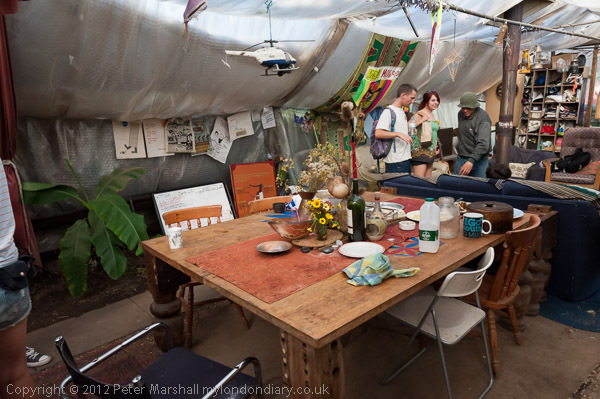 This entry was posted on Tuesday, October 16th, 2012 at 03:25 pm and is filed under My Own Work, Photo Issues. You can follow any responses to this entry through the RSS 2.0 feed. You can leave a response, or trackback from your own site.